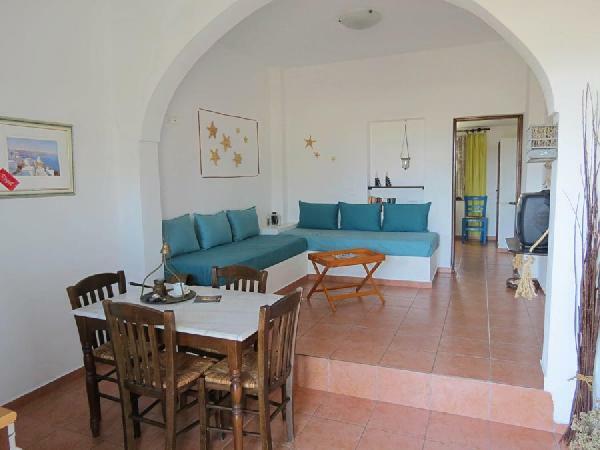 Anna Traditional Apartments is a complex of fully furnished traditional homes and build with love & respect to the island's tradition and architecture. Wood and stone are the main structure of the apartments and the Greek spirit is everywhere. Anna Traditional Apartments has a large swimming pool, perfect for both children and adults. Sunbeds & tropical style umbrellas decorate the pool area. The apartments are only 80 metres from the nearest beach and there is a bus stop 100 metres from the hotel complex with a regular bus to local island destinations. Next to the beach (50 metres away) one can visit local Greek taverns and taste traditional cuisine. All Studios & Apartments have private balconies where one can enjoy incredible views of the sunrise and the breathtaking ocean. Each apartment or studio has a fully equipped kitchenette, refrigerator & a small living room to have your meals. The apartments are on the top floor & the studios are on ground level. All are furnished with traditional handmade furniture. Είστε ιδιοκτήτης ή διευθυντής στο ANNA APARTMENTS; Εγγραφείτε τώρα για δωρεάν εργαλεία, που μπορείτε να χρησιμοποιήσετε για να βελτιώσετε την καταχώρησή σας και να συνδέσετε την ιστοσελίδα σας και το σύστημα κρατήσεών σας.